For another tea party celebrating Hill County’s centennial, I organized a party in memory of the Titanic. Let’s face it-over 100 years later, the ship and its people fascinate us and not just Jack and Rose. I saw Titanic at the movie house, bought it on VHS when it was first released, and now have it on DVD. Do you know what I liked the most? The accurate re-creation of the ship and its interior, the mannerisms and customs of the time, the authentic clothing, music and accoutrements-James Cameron really did a fantastic job. Jack and Rose? Meh. Quite frankly, I liked the 1953 version starting Clifton Webb and Miss Barbara Stanwick much better when it came to a plot line. Of course, the rest of the world was also in a Titanic craze. Royal Crown Derby re-released a line of china they had made for the Titanic, for the a la carte restaurant. It’s gorgeous! The other was originally made by Spode, but was reproduced by a different company and sold on QVC, thus making the dishes available to the masses like me. I own some Spode, but I could never afford a set of these dishes had Spode made them. I don’t know exactly how things were arranged, but imagine Spode had some sort of hand in making the reproductions. No one knows what the pieces looked like exactly, as the dishes were in only First Class VIP rooms and few remnants are found outside the wreck site of the Titanic. Salvaging can only occur outside the wreck site, so machines can’t go into the ship itself and retrieve any artifacts; so there is where most of the dishes are today. Thus, we collectors call this the Titanic VIP set. Of course the china was a hit at my Titanic tea party. I used gold chargers found at Bed, Bath and Beyond under the Titanic china. Reproduction steerage flatware made by Reed and Barton, also purchased from QVC, was used along with salad forks and tea spoons from my Golden Royal Plume set by Wm. Rogers and Sons (antiques store, Butte, Montana) for the dessert course. Knives were by Chicago Cutlery (Herberger’s) and crystal knife rests (Victorian Trading Company) were put into service so as not to stain the hand crocheted table cloth. For the soup course, I used reproduction Titanic Second Class soup bowls (Titanic Store online), thus all classes were represented in the table setting. I used the Royal Crown Derby plates for the dessert course (direct purchase from England; more on that later!). The menu was also Titanic inspired. I bought a copy of a book by Yvonne Hume, great-grandniece of the first violin player aboard the ill fated ship and used some recipes authentic to the Titanic for the meal. You can find the book on Amazon. Appetizers consisted of Blue Devil Eggs, Cheddar Cheese Stuffed Mushrooms, and Smoked Salmon with Dilled Spread served on the First Class VIP china salad plates. Soup course was authentic Titanic pea soup served in Second Class Rimmed Soup Bowls. Salad course was spring greens, Gorgonzola cheese, dried cranberries and pistachios with hazelnut dressing, also served on the VIP china. The entrée was authentic Titanic Chicken Lyonnaisse and yellow rice, served on the VIP dinner plates. Dessert was Strawberry Jam Cake and was served on the Royal Crown Derby plates. Tea cups were Golden Elegance by Royalton China (from my mother), and Longchamp red wine glasses by Cris d’Arques were used for water (thrift store). 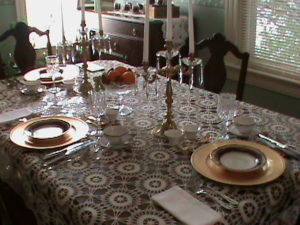 The simple centerpiece consisted of my Spanish candelabra (so elegant, they surely would feel at home on the Titanic!) and my Waterford Emily compote filled with fresh fruit. Candelabra were a thrift store find and the compote was purchased from Cash’s of Ireland. The tablecloth was a hand crocheted piece rescued from the thrift store for a song, and the napkins were simple white cotton ones. Titanic tea party using pieces from all three classes on the ship. Again, please excuse the quality of the photograph!